Someone voting on Nov. 3, 1952, in New York City. Someone voting on Nov. 3, 1952 in New York City. 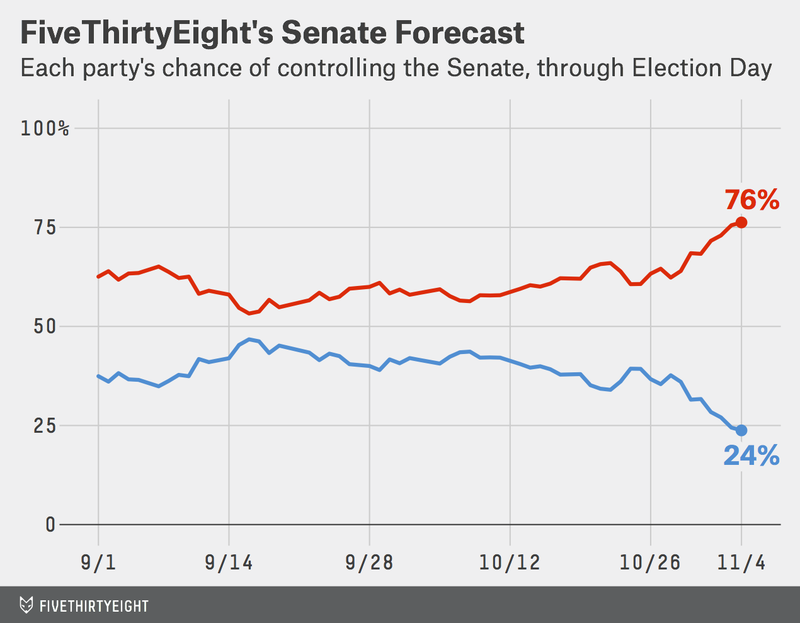 After two months of forecasting, it comes down to this: Republicans are favored to win the Senate. Their chances of doing so are 76 percent, according to FiveThirtyEight’s Senate forecast, which is principally based on an analysis of the polls in each state and the historical accuracy of Senate polling. But they are not necessarily favored to have the race “called” for them on Tuesday night. Because of a variety of circumstances like possible runoffs in Georgia and Louisiana and the potential decision of Kansas independent Greg Orman about which party he chooses to caucus with, the outcome of the Senate may not be determined until days or weeks from now. The forecast refers only to the probability that Republicans will eventually claim control of the Senate by the time it convenes in January. Still, for Republicans, it would be worth the wait after failed attempts to win the Senate in 2010 and 2012. They’ve been modest favorites in the FiveThirtyEight forecast all year, in part because the national environment is favorable for them: the group of states holding key Senate elections lean red; several Democratic incumbents have retired and the others were last elected in 2008, a high-water mark for the Democratic party; President Obama is unpopular and midterm elections have a long history of being challenging for the president’s party. Unlike in 2010 or 2012, however, the polls have moved toward Republicans in the closing days of the campaign — making their position more robust. The movement has been clearest in states like Kentucky, Arkansas and Georgia that typically vote Republican, suggesting the election may be converging toward the “fundamentals” of each state. The uncertainty in the forecast is fairly high. Compared to Republicans’ roughly 75 percent chance, President Obama had about a 90 percent chance of being reelected in 2012, while Democrats had a 95 percent chance of keeping the Senate that year, according to the FiveThirtyEight forecast. And Republicans had about an 85 percent chance of winning the House on Election Day in 2010. For Democrats to make good on their 25 percent chance of keeping the Senate, they would need to win two or three races where they are underdogs according to the polls. Nevertheless, the GOP’s advantage is narrow in many states. Furthermore, polls in midterms and other elections have sometimes proved to have a systematic bias, overestimating the performance of one or the other party in most or all competitive races. If the polls underrate Democrats, they could win. The uncertainty runs in both directions, however. Historically, the polls have been just as likely to be biased toward Democrats as they are to be biased toward Republicans. If Republicans beat their polls, they could win North Carolina and New Hampshire, which only narrowly favor Democrats, and finish with as many as 55 Senate seats — a potential 10-seat swing. It has sometimes been hard this cycle to place the states into neat groupings. Republicans need to win a net of six seats from Democrats. But at least three of these — Montana, South Dakota and West Virginia — are all but guaranteed Republican pickups, while a fourth, Arkansas, has become increasingly certain. On the other hand, Republicans could easily lose Georgia and Kansas, meaning that they’d need to win a gross of seven or eight Democratic seats to finish with a net of six. The battle will mostly be concentrated in the eight states which neither party has established more than a 95 percent probability of winning. These are Alaska, Colorado, Iowa, Georgia, Kansas, Louisiana, New Hampshire and North Carolina. Other states — particularly Arkansas, Kentucky and Michigan — were once competitive but would now require pronounced polling errors for the trailing candidate to win. Still, eight is a large number of competitive states. The good news for Republicans is that they’ll win the Senate if they split them 4-4. The better news is that the forecast favors Republicans in five of them — Alaska, Colorado, Georgia, Iowa and Louisiana — while it gives even odds in a sixth, Kansas. Only New Hampshire and North Carolina favor Democrats. The math is not impossible for Democrats — but it’s difficult. That may be why some Democrats have begun to hope the polls are “skewed” against them. Indeed, the FiveThirtyEight model accounts for the possibility that the polls could have an overall bias toward one party. But suppose they do not. In the final set of simulations we ran, Democrats won just 14 percent of the time when the overall bias in the polls was less than one point in either direction. This represents what we’ve called the “squeaker” scenario — Democrats eke out victories in just enough of the competitive states to win, even though the polls do a reasonably good job overall. The Democrats’ alternative is the “shocker” scenario — the case where the polls do prove to be skewed against them. In the simulations where the polls had at least a 1-point Republican bias, Democrats won the Senate 61 percent of the time. (As should be obvious, Democrats will have no chance at all if the polls prove to have a Democratic bias; instead, Republicans will finish with something like 54 seats.) At this point, most of the Democrats’ 24 percent overall win probability comes from the “shocker” scenario. Their situation is not as bad as Mitt Romney’s was in 2012, but their chances are slim if the polls are basically telling the right story. Although the polls could be wrong, there isn’t much disagreement about what they’re saying. Of the seven forecasting models tracked by The New York Times, all point to a Republican win, and most with about the same probability (75 percent) as FiveThirtyEight’s forecast. Furthermore, they agree on the outcome of all states but Kansas. These include models that rely on polls alone and those like FiveThirtyEight’s that account for polls along with other factors. Those other factors — the so-called “fundamentals” — have tended to converge with the polls over the course of the year. If used properly, they can make a forecast more stable and reduce the statistical noise associated with polling. But they make little difference now, since even those models that once used the fundamentals no longer weigh them heavily. The modest exceptions are in Kansas and Alaska, where the polling has been sparse and (especially in Alaska’s case) potentially unreliable; the FiveThirtyEight model sees the fundamentals as favoring Republicans in each state. But it would still have Republicans favored on the basis of the polls alone in Alaska. And in Kansas, the fundamentals are not enough to make Republican Pat Roberts the favorite. Even if Republicans win, the outcome may not be determined quickly. David Perdue, their candidate in Georgia, has gained in the polls — but the model still has the race going to a runoff about half the time. Louisiana will almost certainly require a runoff. Alaska’s vote may take days or weeks to count, as it has in the past. The FiveThirtyEight model — even with its optimistic forecast for Republicans overall — estimates there’s just a one in three chance that the election will be called for them on Tuesday night or early in the day on Wednesday. For Democrats, meanwhile, there’s almost no chance to win without going to “overtime;” the party will hope to extend the race for as long as possible. There are two Republican wins, however, that could end the race quickly. Pay attention to races in North Carolina and New Hampshire. Both states have early poll-closing times (7:30 EST for North Carolina and 8:00 EST for New Hampshire) and a Republican win in either state would require Democrats to run the table in almost every other competitive race. But Republican wins would simultaneously indicate that the polls might be biased toward Democrats rather than against them, making a Democratic sweep the rest of the night very unlikely. Although this represents FiveThirtyEight’s pre-election forecast, we’ll be tracking the elections for as long as it takes on Tuesday night and Wednesday morning. That will include live updates of our forecast as our partners at ABC News project the winners of various states. We’ve appreciated your readership this election cycle and we hope you’ll join us tonight for our liveblog coverage as the results come in. It should be a fun one.